[A small, cardboard, slightly humanoid ROBOT with bright red wheels and a Sharpied smiley face rolls carelessly through a New York City park. The hustle and bustle of the city does not seem to deter him, while pedestrians yammer on their mobile phones and bundle up from the cold. 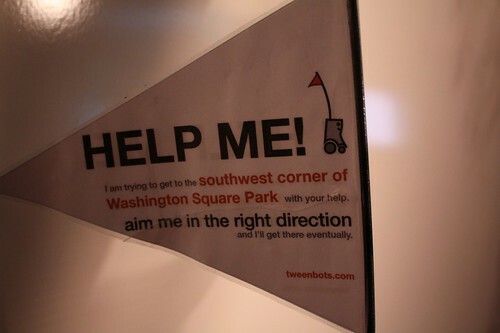 [A PASSERBY is inexplicably drawn to the adorable bot, and leans in close to read the sign - a flag, upon a pole - superglued to the bot, that reads "HELP ME! I am trying to get to the southwest corner of Washington Square Park with your help. aim me in the right direction and I'll get there eventually." PASSERBY: You can’t go that way, it’s toward the road. Here let me help you little robot. [No! Our hero has fallen prey to the rough concrete jungle, his wheels locked, motor burning, as he falls headfirst into a nasty pothole. Suddenly, and inexplicably, a human hand reaches from the air, lifting ROBOT from his asphalt trap, and rights him on his wheels, pointed due southwest toward his goal. Our little hero, you see, relies on the kindness of strangers, challenging the relationship between human and machine, and between human and human. Twenty nine people will help ROBOT on his path across the park, and in just under 3/4 of an hour he will reach his destination, with no mind of his own to guide him. Think of it as crowdsourced driving, albeit at a very slow speed, all motivated by protecting the well-being of an anthropomorphized cardboard machine.